Roger Federer admitted he had "massive regrets" after failing to capitalise on his opportunities during a shock defeat against Stefanos Tsitsipas at the Australian Open. 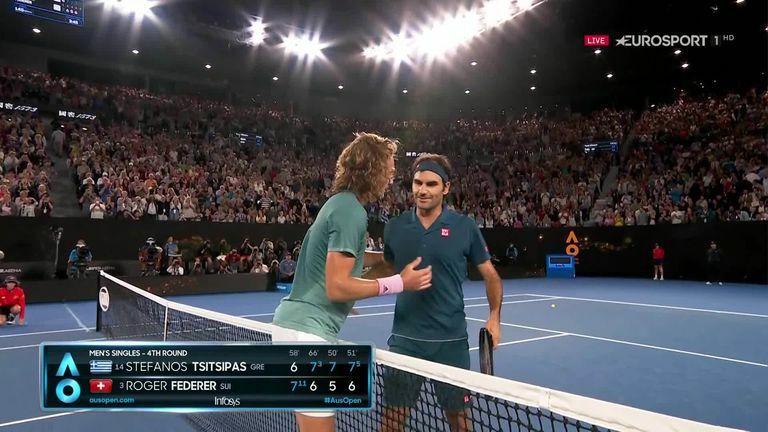 Tsitsipas, 20, ended Federer's hopes of a third consecutive title in Melbourne with a relentless performance to make a big statement of intent on one of the biggest stages in the sport. Federer suffered his first defeat in the tournament since a semi-final loss against Novak Djokovic in 2016 and the two-time defending champion was left to rue 12 missed break-point chances. "I have massive regrets. I felt like I have to win the second set," he said. "I don't care how I do it, but I have to do it. Cost me the game tonight. There is always multiple factors that play into a match like this. "I lost to a better player who was playing very well. He hung in there, gave himself chances at some point, stayed calm. It's not always easy, especially for younger guys. Credit to him for taking care of that. "I love John. I've heard that story the last 10 years. From that standpoint, nothing new there," the 20-time Grand Slam champion said of McEnroe's comments during the on-court post-match interview with Tsitsipas. Tsitsipas, one of the sport's rising stars, maintained a high-level of tennis as he saved four set points to avoid falling two sets down and recover to become the first Greek man or woman to reach a Grand Slam quarter-final. Both players produced tennis of almost mirroring playing styles, but Tsitsipas' conviction in the pressure moments proved crucial as he secured another notable victory in his burgeoning career. "About Stefanos, I think he's definitely done a really nice job now the last year and a half. I mean before that, too, obviously," Federer added. "But beating Novak in Toronto, the likes of (Kevin) Anderson and (Alexander) Zverev, now me here. That's what you need to do to get to the next level. He's doing that. It's really nice for him. Federer also revealed his intention to play at this year's French Open for the first time in four years, having opted to skip the clay-court season in the past two years.